Do you want to add products using a spreadsheet file? You're in the right place! Psst! If you do not have product data yet, feel free to use our Sample Data! Read how to get and use it, here. NB! DO NOT have spaces between the characters, like "Women > Fashion". The only "required" field is PRODUCT CODE. Your spreadsheet does not have to contain all the fields ShopRoller offers - pick and choose the data you would like to import. IF you import either "Ostuhind (km-ga)" (Wholesale Price [with tax]) or "Müügihind (km-ga)" (Retail Price [with tax]), then you MUST also have the "Käivemaks (%)" (Tax [%]) field. Go to CATALOG > PRODUCTS, then use the search filter: "Date Uploaded" (or "Date Modified" if your first import of these products were not "today") to find them. You can also use the search bar above your menu to look for particular product codes, brands, names, etc. Product Code: an identification number you use for your product organisation. This field is a requirement for EVERY product - and is also the only "required" field. Matrix Code: This field is required only if importing matrix/ variant products. It should be entered in the rows of Variant Products ONLY. Enter the "Product Code" of the parent "Matrix Product" into the "Matrix Code" field. Product Name: What your product is called. EAN Code: This is the "International Article Number" (also known as European Article Number or EAN), a standard describing a barcode symbology and numbering system used in global trade to identify a specific retail product type, in a specific packaging configuration, from a specific manufacturer. The most commonly used EAN standard is the thirteen-digit EAN-13, a superset of the original 12-digit Universal Product Code (UPC-A) standard. Short Description: A very concise message about your product, such as "16ml Lipgloss". 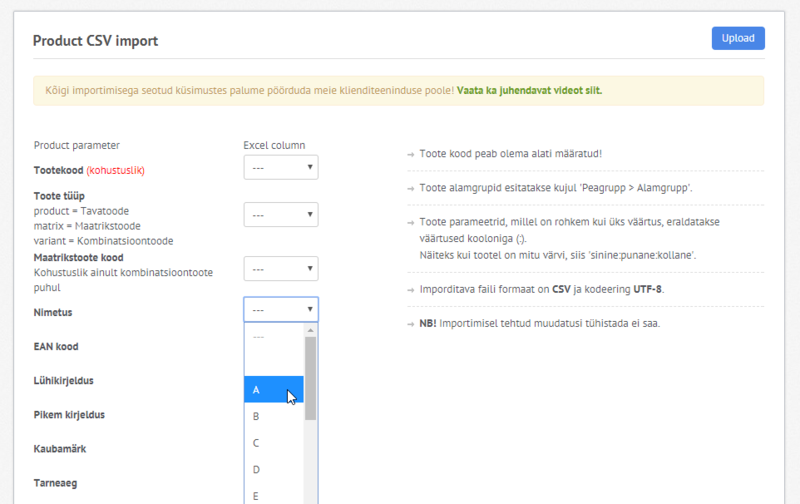 The text is displayed in both the product page (when in list view) and in the product window. NB! This is only required for Simple and Matrix Products - NOT required for variant products. Long Description: A long message about your product - this product description can be super long and detailed if you want :) This text is displayed in the product window. NB! This is only required for Simple and Matrix Products - NOT required variant products. NB! Formatting in your spreadsheet will not be carried over. Brand: The brand your product is from. Unit: How you measure/ sell your products, such as by: piece (pc), set,kilogram (kg), etc. Tax (%): What percentage of tax must be paid from the total purchase price? Wholesale Price (without tax): How much you purchased the product for (ie. the cost), without tax. Wholesale Price (with tax): How much you purchased the product for (ie. the cost), with tax. Retail Price (without tax): How much the product will cost your customer (ie. the price), without tax. Retail Price (with tax): How much the product will cost your customer (ie. the price), with tax. Retail Price Calculation: How you calculate the price your produce will sell for. Fixed Price: You will set a specific cost yourself, per product. Wholesale Price + Markup (€): The product cost plus a fixed dollar/ euro amount on top. Wholesale Price + Markup (%): The product cost plus a fixed percentage on top. Discount: If the product is to be sold at a lower price, indicate the discount price. Discount Type: How is the discount price calculated? Length / Width / Height / Volume: Columns for dimensions of the product; size may affect shipping. Shipping Weight: How much the product weighs for shipping; weight may affect shipping prices. Window Title: Only required for Simple and Matrix products (NOT Variant products). You might want to include this data if you would not like the "Product Name" to be the title, as seen in your storefront. Stock Control: This setting refers to whether you manage or track stock availability. If you have limited stock (and particularly if you use a warehouse), it is good practice to select YES. This is so that you can set and display stock levels for your products, such as "5 products available". In contrast, if you do not control your stock or are not particularly limited with stock quantities (such as for dropshippers or sellers of hand-made crafts) you might select NO. NB! You can also edit this setting per individual product by updating the "Lao Toode" field in the particular product card. Product Image Link (1-5): Select up to 5 columns for URL's where your product image can be found. If you are importing a matrix product, product images can be uploaded per each variant product (eg. to showcase individual colours of a product). You can add Image URL's from your ShopRoller File Manager. The URL must be for the image ONLY - not an entire webpage URL. For more information, read more under "important notes". Product File (1-5): Select up to 5 columns which contain files about the product. You might use product files if, for instance, you have detailed brochures or manuals you would like to show about the product. Product Video (1-5): Select up to 5 columns which contain video links. Display Stock Level: Would you like for your customers to see how many products are left? Public: You can indicate whether everyone can see your products, or only registered users. This setting can also be individually changed in the PRODUCT CARD page, under MORE > PRIVACY. Related Products: Select what type of "related product" you are indicating, and which cell the data is in. Related Products: products which are suitable to purchase together, such as socks with shoes. People often use phrases like "People who purchased this, also purchased..."
Similar Products: products which are comparable to the initial product, such as "other t-shirts". People often use phrases like "You might also like..."
Product Parameters: This section refers to your matrix product variables, such as colour or size. Before importing, you might want to double check that your spreadsheet data is compatible. 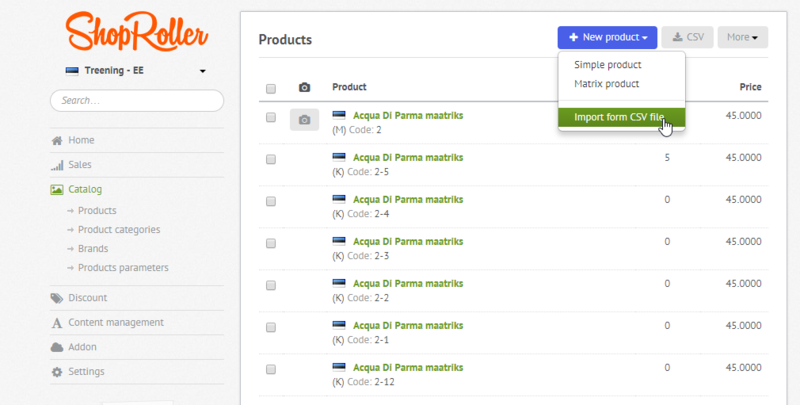 If, like in the image below, product data starts from Row 3 (or later), then "blank products" will be uploaded. For better results, please ensure you remove additional rows from your spreadsheet! NB! If, like the image above, you have headings in your spreadsheet, please select YES in your ShopRoller account under the heading "Excel first row contains field names?" Check that Product Types and Codes are written compatibly. Simple Product: a product you purchase as is, without alternative options / variables (eg Basketball). NB! If your cells auto-capitalize your text, you can FORMAT the cell as TEXT. So, in the example above, we have a lip gloss product and a face kit product. The face kit does not have variants - it is to be purchased "as is". As such, the PRODUCT TYPE column should read as "simple", and the MATRIX CODE column should be empty. The lip gloss comes in three colours, light pink, pink, and dark pink. This means that the lip gloss is a "matrix" type product, and should as such in the PRODUCT TYPE column. Then, the variant products need to be specified. As you can see in the image above, the three coloured lip glosses were listed as a "variant" PRODUCT TYPE, and are the only rows which contain data in the MATRIX CODE column. Select up to 5 columns for URL's where your product image can be found. First, you will have to upload the images you want to use to your ShopRoller File Manager. NB! Pay attention to your file organisation, as the navigation path (folder/ file names/ location) will form the URL. NB! The Platform is case-sensitive, so be sure to write an exact match. 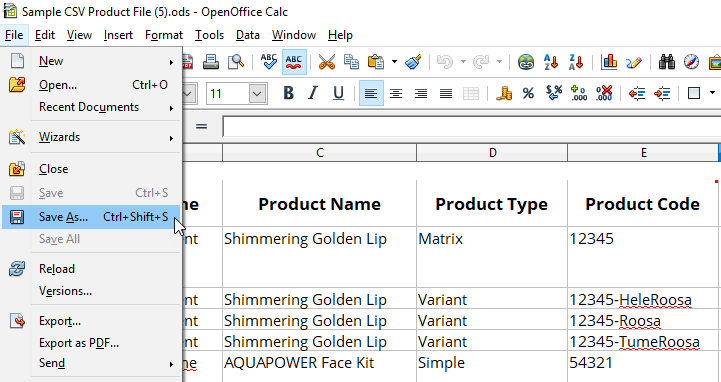 Here is how to do that from OpenOffice Calc. We recommend this is the program you save your CSV from! You will need to match up the columns of your spreadsheet with the fields in your ShopRoller account so that they reflect. Click the drop down field EXCEL COLUMN, and select the letter of the column as seen in your spreadsheet. For example, if "Product Name" was in Column "A" in the spreadsheet, the "Nimetus" field in ShopRoller should show "A". Language: What language is the spreadsheet data in? Which storefront language will the products be imported to? Copy images to ShopRoller server? You have your own file manager in your ShopRoller account. Would you like for your images (from the URL) to be imported into your file manager too? Does the first row of your spreadsheet contain headings? Select YES if you have headings in your first row, or NO if your data list begins immediatley. Your products must start from no later than the second row. NB! A "delimiter" is a character used to specify the boundary between separate, independent data regions. CHECK the box if you only wish to modify existing products, based on your modified spreadsheet. Do not import new products; ONLY change existing products, based on Product Code. Once you have completed configuring your ShopRoller account with your CSV spreadsheet, you can upload the file. NB! Once you have started the import, it cannot be cancelled; products can be deleted later though. Scroll to the TOP OF THE SCREEN, and hit the button UPLOAD. Do you have more questions about the CSV import? Have a look! 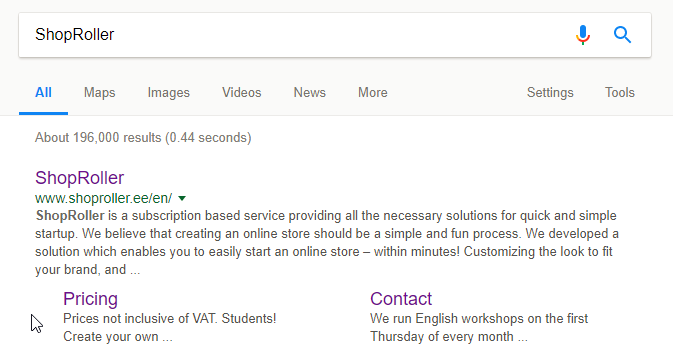 Where can I get Product Media URL's from? This means you can store your files wherever you like online, such as your ShopRoller Fail Manager, Google Drive or Photos, DropBox, or even a simple website URL, etc. How can I use Media URL's from your laptop/ desktop? When importing products by CSV file, the image URL column cannot be a laptop/ desktop pathway (URL). Instead, product images should be uploaded into your File Manager - or to ano ther online manager . Once online, these media pathways (URLs) can be used in your CSV media URL columns. Entering Media URL's from your File Manager into your CSV file can be done either before the files are actually uploaded into your File Manager - or located after. The following steps are for those whom already have media (images, videos, files, etc) uploaded into ShopRoller. View your File Manager by clicking CONTENT MANAGEMENT > FILES. Find "PATH" for the image location in your FILE MANAGER. Alternatively, add data first - import images to ShopRoller later. If you have not uploaded your files yet, you could first define your product media organisation in your spreadsheet, THEN upload products according to the pathways you laid out. NB! Our system is case sensitive, so pay attention to exact spelling. My Product Groups didn't appear? Check that you do not have spaces between your written product groups.